Driving south on US Highway 95 toward Tonopah, Nevada, a brilliant light shining above the desert floor catches your eye. Stretching over six hundred and forty feet in the air, a solar tower collects sunlight from over 10,000 mirrors focused on its apex. 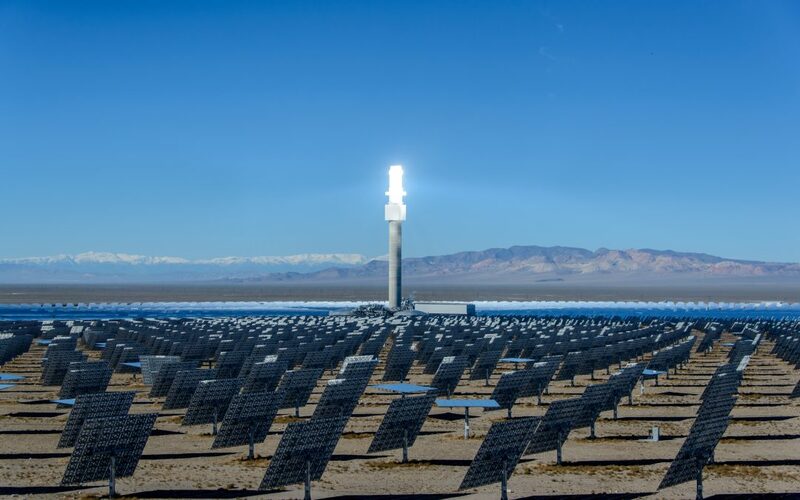 SolarReserve’s Crescent Dunes Solar Energy Facility near Tonopah, Nevada, generates enough energy from the sun to power 75,000 Nevada homes during peak demand periods, day and night, whether or not the sun is shining. The project began operating in late 2015 and delivers 110 megawatts of electricity, plus 1,100 megawatt-hours of energy storage per year. I was fortunate to have been on a tour of the facility a few months prior to when it went online. The plant manager estimated that the facility would pay for itself in less than two years. There were no issues getting it on the grid, and it’s a “zero emission” facility. All power generated by the Crescent Dunes project in the next twenty-five years will be sold to Nevada Power Company for 13.5 cents per kilowatt-hour. For comparison, the price to California residents in September 2018 was at 19.39 cents per kilowatt-hour (U.S. Energy Information Administration). The project includes 10,347 heliostats that collect and focus the sun’s thermal energy in order to heat a salt mixture flowing through a 640-foot tall solar power tower. The molten salt circulates from the tower to a storage tank, where it’s then used to produce steam and generate electricity. Excess thermal energy is stored and can be used to generate power for up to ten hours, including during the evening hours and when direct sunlight is not available. About one hundred and thirty miles northeast, other structures reach upward from the desert floor. Pump jacks continue to pull oil from wells in remote Railroad Valley—and there soon might be many more. At the same time projects like Crescent Dunes Solar Energy Facility are now providing clean, affordable energy, oil and gas companies are eyeing Nevada for development. This comes as a result of the present administration’s aggressive push to lease public lands for oil and gas development. New land leases and expanded oil/gas drilling might be in the state’s future if this effort gains momentum. The Silver State is experiencing an oil and gas transformation when it comes to leasing. The Bureau of Land Management has put hundreds of thousands of acres of public lands up for auction and is pushing for even more under the administration’s “Energy Dominance” agenda. More leases in sensitive areas could be in Nevada’s future. Protests and litigation by environmental groups are heating up. Ranching, tribal, and sportsmen communities have also expressed their concerns. Nevada’s schizophrenic nature is well known when it comes to land rights and usage, and this issue could become explosive if wiser minds don’t prevail. In August of this year, I hiked Boundary Peak with my daughter. The mountain gets its name from its location on the western boundary of Nevada, with California at its border. At 13,143 feet in elevation, it’s the highest point in Nevada. When we made it to the summit, a storm began rolling in, dark clouds highlighted by streaks of lightning in the distance. To the east, we could see the Crescent Dunes Solar Energy Facility glowing brightly in the distance, 80 miles away, a bright contrast to the approaching storm. A video (produced by Wired) about Crescent Dunes Solar Energy Facility can be viewed HERE.